This couscous salad was featured in the English publication Mail Online Food & Drink. Not only is it a feast for the eyes, it has fabulous flavor with sweetness from the dates and sourness from the lemons. Best of all you can control the flavors. You can use either Moroccan or Israeli couscous. Moroccan couscous is a smaller grain than Israeli. This picture is the salad using larger Israeli couscous. This couscous salad recipe features toasted pine nuts, sweet dates, parsley, mint, lemon and a zesty red wine vinaigrette. It's a perfect accompaniment to any meal. If you don't know how to toast pine nuts, don't worry. We supply the how to in our "cooks tips" that follow the recipe. 1 1/2 cups Moroccan or Israeli couscous - cooked according to package directions. Cook the couscous according to package directions. Spread couscous on baking sheet that has a lip around it or in a large bowl to allow it to cool. Mix the red wine vinegar, olive oil and salt together well. Pour half of vinaigrette over the couscous and stir to help prevent sticking. The couscous will also absorb the flavors as it cools. 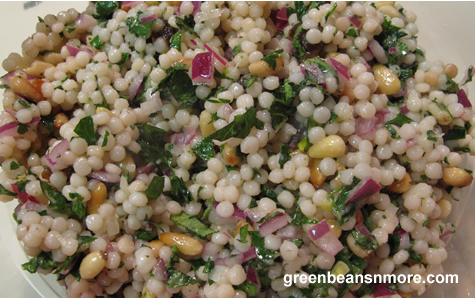 Once the couscous cools add the remaining vinaigrette, red onion, mint, parsley, dates and pine nuts and lemon zest. Mix together. Add lemon juice to taste. Cook's Tips: You will use more or less vinaigrette depending on the couscous you use. You want the couscous moist but you don't want this salad swimming in vinaigrette. The flavors are best if it's served room temperature of slightly warmed in the microwave. How to toast pine nuts: Place the pine nuts in a dry heavy skillet making sure they are in a single layer and have room to move around. If not, cook in several batches. The following batches may cook more quickly as the pan will be hotter. Cook over medium heat, constantly moving them around the pan to prevent them burning. Allow some time for them to toast, you'll see them brown and smell them. DON'T WALK AWAY because once they start to toast it goes quickly. As soon as they are toasted you want to get them out of the hot pan - put them on a plate to cool.